^I feel okay calling it that, because how do I know that we didn’t all die and just haven’t realized it yet, like Bruce Willis in the Sixth Sense? Plus we were experiencing a blizzard and lightening at the same time over here, so that felt pretty end-of-the-word-ish. 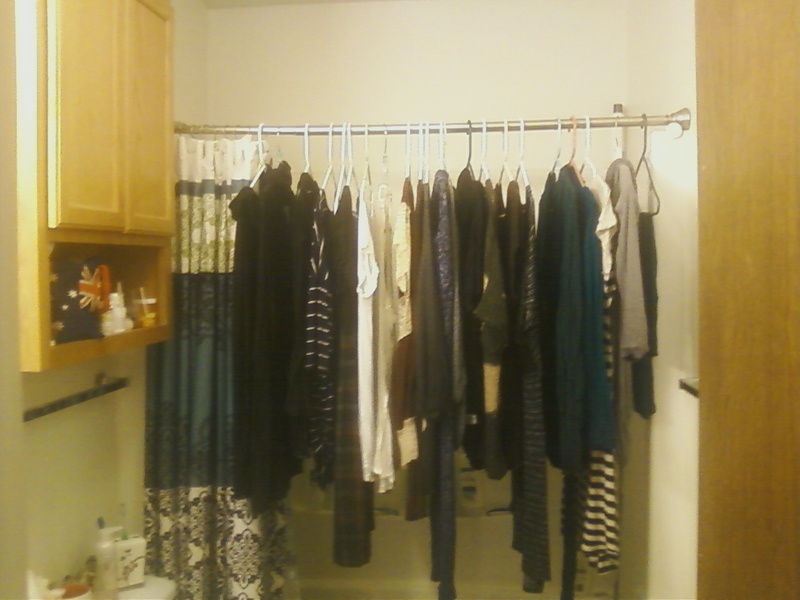 Turned my shower into a closet. I finally got around to hand-washing the 20 or so hand-wash only outfits that had been rotting in a canvas bag in my bedroom, saturating in their own faint stench of arm pits for the past several months. In the process I accidentally flooded the bathroom and broke our drain. I still can’t fix the drain, no matter how many times I beat it with a butter knife. 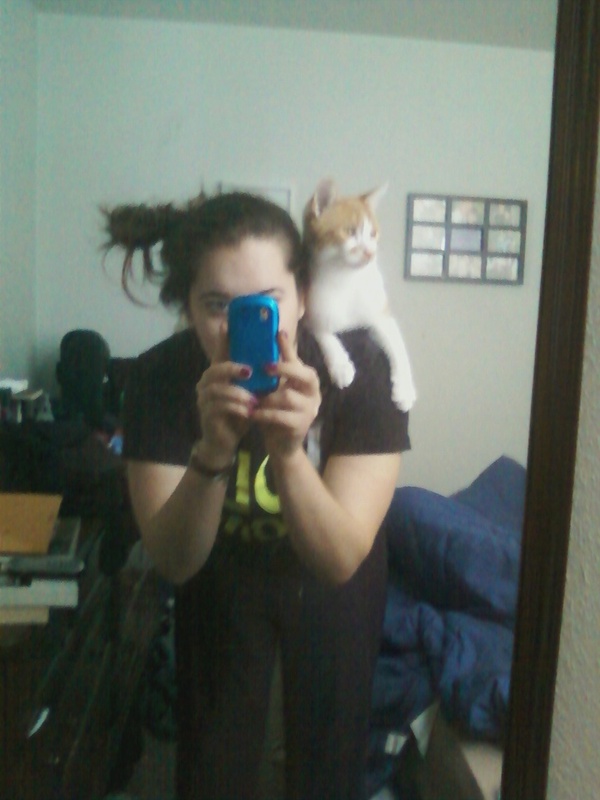 Gave Ketos-Man piggyback rides around the apartment. Please ignore the fuzzy, long-legged spider attached to my scalp. That thing must have crawled on there in the night. Did this to my fingernails. That’s all. Just wanted to leave you with a picture of me looking fun and flirty so that the picture of the spider on my head is not the last image you have of me in your mind. Previous Previous post: I can feel my face. Soo.. where do you shower now? And does is the cat involved? The cat is pretty much always involved in my showers, walking along the edge of the tub until I finish. I moved the clothes back into the closet before my boyfriend’s next shower, but not before he stepped in all the water that had dripped onto the floor and got really angry. My Bad. What?! We have to stop listening to Christmas music after Christmas is over?! I didn’t get that memo…I try to stertch it out until at least March…then I take a break for a while and crack it out again in August. I’m such a dork. Tis the season for red nails Jo…like your hair do in the pic with the cat on your shoulder. You’re right, that must be where I went wrong. 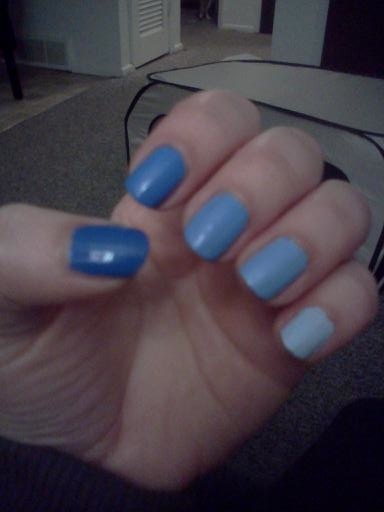 I think all the snow put me in the mood for blue. Plus, I didn’t want to offend any Jews. 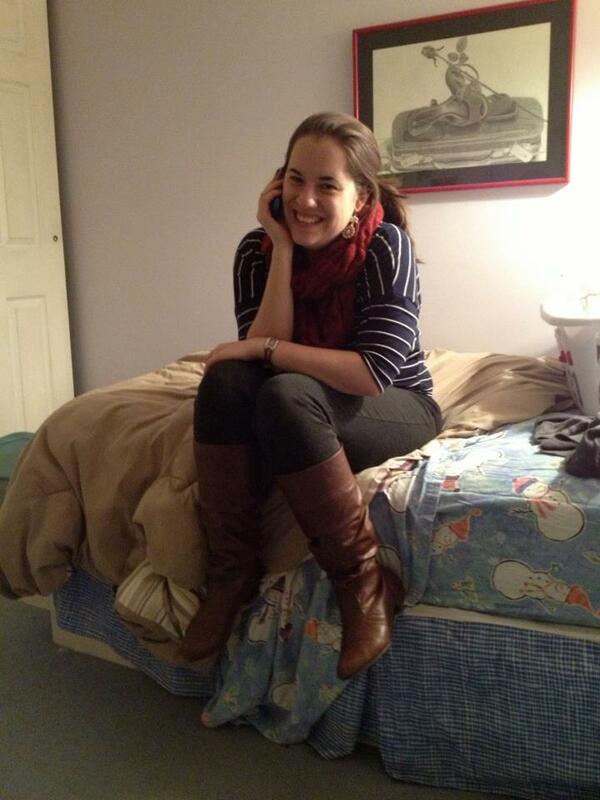 “I did finally get my first and last compliment at around 9:17pm.” Ha! Side note: I’m so impressed with the fact that you actually went ahead and tackled your hand-wash-onlys. Well, really, the fact that you have hand-wash-onlys in the first place. Pluralizing “only” just now, by the way, caused me so much stress. I probably should have gone with “onlies”? But that just looks weird. But so does “onlys”. This is a nightmare! Carry on. This was worth the stress. You made the right choice. Onlys > onlies. Washing machines > Hand washing. Since there is so many fields of siiepaltecs that I have a choice of, I still really can’t choose one. So I am going base on my personal experiences. My original goal back in high school and maybe even before that, was to work in a Neonatal ICU! I had a brother that passed before he had his first birthday from heart complications, and that year I spent a lot of time at hospitals with my parents. My goal the first couple of years was to work with babies just like him. That was until I had my own children, I would of still loved to have worked in that career field but the heart ache I would most likely endure when one of those babies did not make it home. 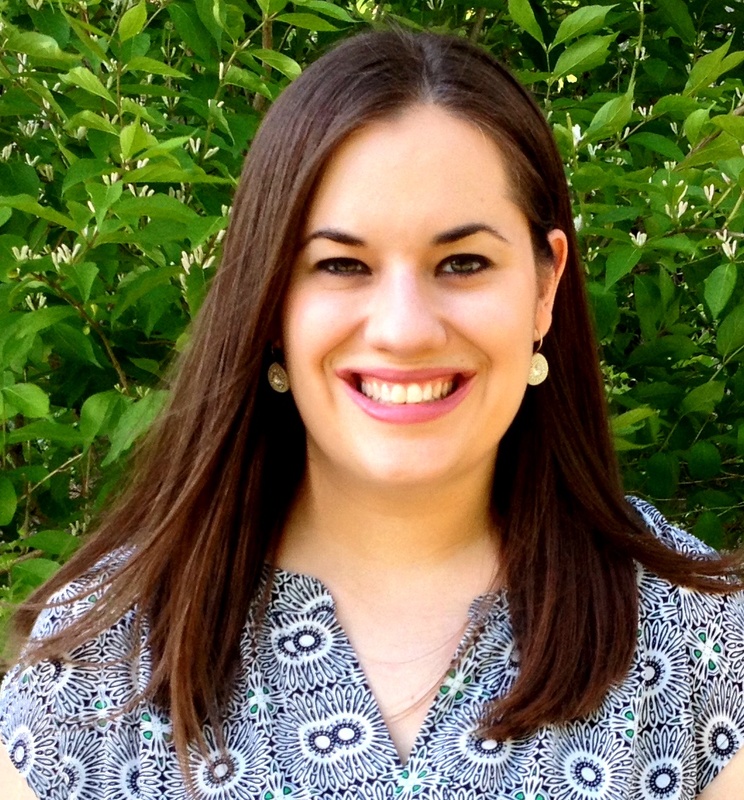 I could not have handled!On to more positive experiences, I have worked with the elderly and Geriatrics interests me very much. Being surrounded with people that have lived a fulfilled life is so much more rewarding. Even though at times it is the ending stages of their lives, and it is sad when someone does pass. It’s less of a heartache to know that most of the time they are ready to move on. They are still very dependent on you and when you are able to help them with their needs that’s the most rewarding of all, plus you form a special relationship with the patients and their families.